For the first part of my year abroad, I am spending my TEFL internship in Madrid, Spain and I have discovered a lot not only about teaching but also the Spanish culture and teaching Spanish people English. “Western Europe offers such a mix of wonderful countries that choosing where to teach can be extremely hard. There’s a downside to Western Europe though (a pretty big one! ): it’s really, really pricey.” “The upside is that your wages will reflect this. You can certainly expect a higher salary than any you’d get in Eastern Europe, but your money will need to stretch a lot further and it’s not likely that you’ll put away too much in the bank. You might not earn enough to save as much as you could in Eastern Europe, but you’ll certainly earn enough to live comfortably.” One of the most common mistakes that Spanish speakers make, from a grammatical perspective, is being able to distinguish the difference between the verbs “make” and “do” and the reason for this, is simply because they only have one meaning for the word. “Like other Latin-based languages, Spanish has the same word for both “do” and “make,” despite the big difference between the words. This confusion will come up more than a few times when teaching SSS since, to them, the resemblance is uncanny. 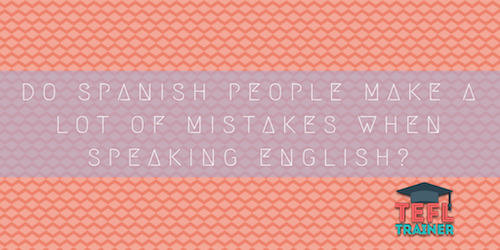 Even with the more advanced students you’ll hear things like “making work” and “doing progress.” This is one of the most frequent examples, however, since working in Spain, I have noticed that Spanish people make more mistakes. Another obvious mistake that Spanish people make is pronunciation, but, to the point where it is impossible to understand them and more commonly when they have a good level of English. One of the biggest encounters I have faced whilst teaching is being able to distinguish sounds like “sh” and “s” and producing a clear “th” sound. As the “th” and “sh” sound doesn’t exist is the Spanish language, I have had to do some activities with the students to enable them to develop these sounds. Furthermore, I have noticed that a student pronounces the letter “v” as a “b” because that is what happens here in Spain and, so they get used to pronouncing it the same when speaking English. As I studied phonetics at university, I thought I would find it easier, however it can still be quite difficult. One example of this was I had a student who had a B2 level in English, however, she had difficulty pronouncing the “th” sound and no matter how many times I demonstrated it and we practised it together, she simply didn’t get it. My first impression was that I was doing something wrong, however once I spoke to the headteacher, he demonstrated some exercises I could do with the student to prevent this from happening again. While I acknowledge that there are sufficiently more common mistakes, I have drawn attention to these two, as they were two of the first encounters that I had to combat and figure out how I could communicate these ideas to my students in a practical and educative way.